As a mommy to two little ones, it's very seldom that I get a moment to myself; it seems as if I have at least one permanent companion at all times. I'm not complaining; I'm kind of enamored with my babies and I love that they seem to be endlessly fascinated with me and all my doings. It's like having an in house fan club! The only time it gets a bit tiresome is when it comes to going into the bathroom, for any reason whatsoever. I tend to have tagalongs for that, regardless of the, uh, task at hand. I took ill over the weekend, and was literally down for the count and weak with fever until last night. When I finally surfaced from my haze (and got a proper whiff of myself), I decided to indulge in a bath (as I was still too weak to stand in the shower for a substantial amount of time and it seemed as if the babies were sufficiently distracted at the time). See, when the little ones hear bath water running, it's like the Bat Signal: they stop whatever they are doing, run from where ever they were, and either disrobe (London) or attempt to catapult themselves, fully clothed (Kenzie) into the tub. So it truly is a luxury for me to take a bath, particularly one all by myself. As such, I have many accoutrements associated with taking a bath: oils, salts, candles, and my favorite, bubble bath. Other than the Purity Made Simple Facial Cleanser (which I love), I haven't had a lot of personal experience with Philosophy products, but I have heard a great deal of wonderful things about them. 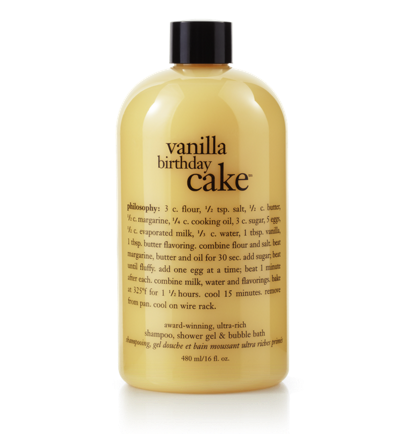 So I was very excited to try their Vanilla Birthday Cake Shampoo, Shower Gel, and Bubble Bath. I honestly got it with no interest in using it as anything other than a bubble bath, but I do think it's pretty awesome that it is so multi purpose. So I was kind of psyched to be using this bubble bath for the first time; I was envisioning luxurious, frothy bubbles and for the bathroom to transform into a homey little bakery as it filled with the warm, sweet scent of rich vanilla birthday cake. However, neither things occurred. Womp womp. Unfortunately, the bubbles were sparse, minuscule, and faded within minutes of forming in the bath water. And the scent was virtually nonexistent; I had to take a deep whiff straight from the bottle to reassure myself that it was supposed to be fragranced. Sigh. Anyway, Kenzie decided to join me in the bath before the tub was even halfway full. C'est la vie. I ended up utilizing the other 2 purposes of the gel; I used it as shampoo and shower gel for the baby. It actually worked quite well in those capacities (though I truly wish the fragrance was little more potent). So it wasn't a complete fail, just one for the intents and purposes I actually purchased it for.